A dozen pale Norwegians seek shelter among the 200 stadium seats, mercifully covered by a roof. A young, bearded American wrings out a wet towel over his bald head. An orange-clad Dutchman creaks by, white hair poking out from beneath a Florida Gators baseball cap. Elderly Japanese men stretch against a chain link fence as an Englishwoman putters by carrying a parasol, except it's not a parasol but just a golf umbrella. It is St. Petersburg, Fla., and it is hot, and that fact is not especially newsworthy. But most of these people are not from here, and most of the places they are from are a lot colder than St. Petersburg. 1994 and 1985 are a long time ago and a lot longer time ago, respectively. 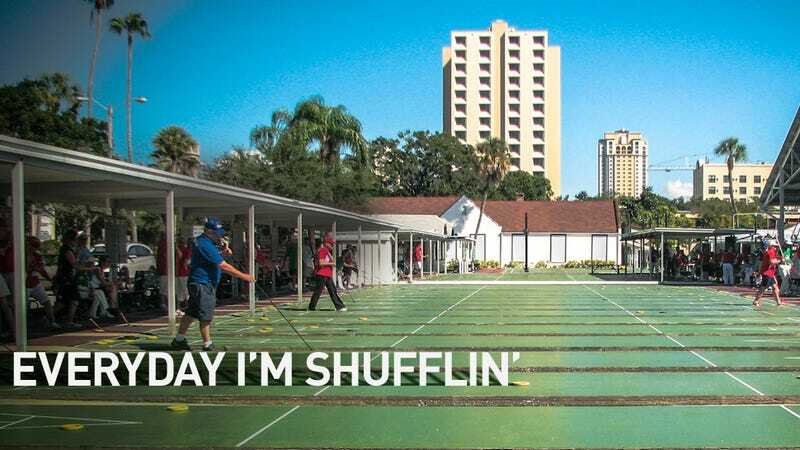 Can shuffleboard regain the relevance it had two generations past, when it fell behind only golf and tennis as America's favorite outdoor sport? Probably not, but the revival of this very basic game rests in the hands of the most unlikely of partners: hipsters, and "well-connected" Russians. Just like the Olympics, the World Shuffleboard Championship begins with a parade of nations. 160 participants marched into the lawn adjacent to the club early Monday morning under a gray sky that betrayed St. Petersburg's moniker. The clouds were not just literal; as a PA system performed each country's national anthem (often stopping halfway through after the sound person realized he had gone into the second or third verse) the obvious absences among competitors became apparent. Perhaps the most glaring absence—one that threatens the very legitimacy of this championship—is that of Torben Hussmann. The 19-year-old German wunderkind is back home in Frankfurt, where he's an International Sports Management major at the Accadis Hochschule Bad Homburg. His studies, it seems, are more valuable to him than international shuffleboard glory. The opening ceremony does not linger on those missing, though. Instead, it draws attention to the newcomers. England, Ireland, Holland, South Korea, and Egypt all brought teams to the ISA Worlds for the first time. Egypt's representative, Sofia Hammamy-Deuse, was especially popular. Every delegation is easily identified. The Australians are the most nattily dressed, in green and yellow polo shirts with the official ISA sleeve patch; Canadians are everywhere, with the most competitors (many of them live in Florida much of the year in retirement); the Brazilians are young and brash. The American squad is perhaps the most motley crew, with ages ranging from the early 20s to the mid-80s. Local phenom Erik Hahmann is here, and represents perhaps the U.S.'s best hope of winning a world championship. (In day one, Hahmann—who moonlights as an editor at SB Nation's Rays blog—defeated Shuffleboard Hall of Fame member John Brown before losing two matches, one to Canadian champion Henry Strong.) So, too, are the young proprietors of America's next hotbed of shuffleboard, the Royal Palms in Brooklyn, Jonathan Schnapp and Ashley Albert. The tournament is run as a round-robin of different groups, much like soccer's World Cup. The champions of each group then meet in a playoff, so while early defeats aren't crippling for a player's chances to advance, early wins put players in a solid driver's seat. The German squad made its mark Monday, with both Dieter and Birgitt Hussmann picking up wins that gave them an advantage in their respective groups. (They're Torben's parents.) Can the Hussmann dynasty that has dominated the German and European championships claim a world title for Deutschland? Or will the heat be too much for their Teutonic demeanors? We'll be on the scene all week, so keep checking back for your daily updates. Tomorrow: how hipsters and Russians are driving the new era of competitive shuffleboard.